Superb modern two bedroom flat conveniently located on the edge of the City Centre with its own private designated parking bay. Early viewing recommended. Situated in the particularly convenient location of Port Dundas, just one mile to the North of the City Centre; the property is within easy reach of the City Centre, West End and major M8 motorway network. As well as quick and easy access via motorway network, there are excellent public transport links including numerous bus stops nearby. Nearest train stations are Springburn and Charing Cross, both of which are around five minutes drive away. Alternatively, the nearest subway stop is Cowcaddens which is less than five minutes drive away, making it ideal for those commuting across the City via outer and inner line services. Wide range of amenities nearby including Glasgow Royal Infirmary, University of Strathclyde, Glasgow and Glasgow Caledonian, Royal Conservatoire of Scotland and Glasgow School of Art. Ideal for young couples/ professionals alike as well as those studying locally. Comprising well maintained and pleasantly decorated apartments of reception hall, appealing large lounge with French doors to Parisienne style balcony, modern fitted kitchen with full range of built-in and integrated appliances, further enhanced by a small breakfast bar arrangement, two bedrooms both with built-in wardrobes and quality modern bathroom with shower fitment. The property benefits from gas central heating, double glazing and controlled entry system. There is a designated private parking bay for the flat to rear of the property. 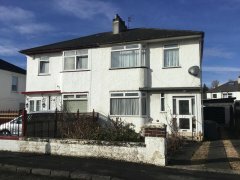 Offers Over £139,950 SOLD 39 Mb/s *est.